These insights have been published today in Nature Scientific Reports, and show that the structure of marine life communities depends on depth and small-scale features on the sea floor. Extinct deep-sea volcanoes, or seamounts, are biodiversity hotspots, hosting substantial coral and sponge communities and abundant fish stocks. The study used video footage from a robotic remotely operated vehicle (ROV) up to 3 km deep, collected during a research expedition. From the video, Lissette and her fellow researchers from the NOC and the Universities of Bristol, Essex and Newfoundland identified over 30 000 animals living on the surface of the Annan Seamount in the Equatorial-Atlantic, including spectacular cold-water coral colonies. By applying statistical models, the scientists were able to tease apart how changes in the biological communities are structured and what drives these patterns. They found that the structure was controlled by small-scale changes on the sea floor and that the key difference between the marine life communities was the identity of species, rather than the number of species. 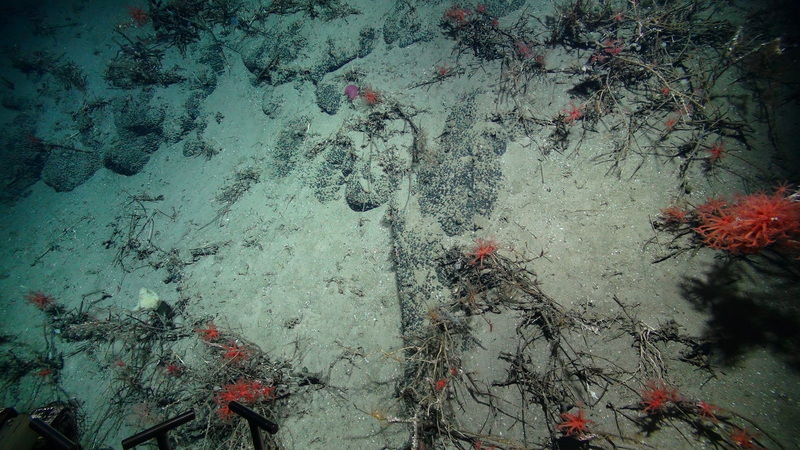 This finding suggests that any human activities that alter the seafloor, such as potential deep-sea mining, could have a big impact on communities of marine life around the seamount. “I am especially excited about our results, since seamounts are really poorly studied, and now we can investigate whether these patterns hold in other seamounts and regions and continue forming links between local and regional deep-sea biodiversity patterns,” Lissette continued. On this seamount researchers found that animals clustered in certain areas, either as a cluster of one species, or as dense groups of different species. In one area the team found hundreds of sea urchins coming together to mate, which has rarely been observed. An area of deep-sea near the seamount was also found to be full of soft corals. These findings can be used to prevent human activities from disrupting or destroying these communities of important marine species. This research is part of the ERC funded CACH project (Starting Grant no 278705), and forms part of the NOC’s on-going research into deep-sea ecosystems, as well as investigating the potential impacts of marine resource exploration.